But is the missile a good fit for the mission? The U.S. Navy has awarded a contract to fit an undetermined number of its long-range Tomahawk cruise missiles with upgraded sensors that will allow the land-strike weapons to target ships. These Maritime Strike Tomahawks will provide a relatively low-cost anti-ship capability as the U.S. Navy works to make up for long-standing gaps in its ability to target adversary fleets, but it’s unclear how they will stack up against other anti-ship cruise missiles (ASCMs) being introduced in the fleet. The U.S. surface fleet has long led in its ability to provide air defenses over wide areas and launch devastating strikes against targets on land with the existing Tomahawk missile variants, but lags against potential adversaries in being able to sink other ships at long ranges. Russia and China have continued to design and introduce advanced, long-range, and high-speed anti-ship cruise missiles to defeat the sophisticated air defenses on modern warships. The U.S. Navy has long been conspicuous for having only the 1970s-designed Harpoon anti-ship missile to target enemy ships with. Compared to the most advanced adversary missiles, the Harpoon is slow, un-stealthy, and has a paltry 70 nautical mile range (top-of-the-line adversary missiles are believed to have ranges twice that or more). Compounding those disadvantages in a face-off against a well-armed adversary fleet, only a little over one third of the U.S. destroyers in commission or under construction are even capable of carrying the Harpoon, and the oldest third at that. The rest had no over-the-horizon weapon to engage another warship with until a new high-performance air defense missile, the SM-6, was hastily – by Pentagon procurement standards – modified to be able to engage ship targets. The new Maritime Strike Tomahawks would have a 900 nautical mile range, far longer than anything else being deployed except for China’s anti-ship ballistic missile program. But while that range is useful for hitting fixed targets on land, it’s less clear that the Tomahawk’s full range could be utilized in a maritime environment. For use against moving targets, like adversary fleet, they would have to be found, fixed, and tracked with sufficient accuracy to guide in a salvo of ASCMs. China has worked to develop a complex long-range radars and satellites to feed targeting information to its anti-ship ballistic missiles, it’s unclear how targeting the Tomahawks at their extreme ranges would work. Early tests of the maritime Tomahawk were guided in by aircraft, so it might require using surveillance assets working much closer to the targets than the firing platform, and many of those could likely carry ASCMs like the Long Range Anti-Ship Missile to engage enemy ships themselves. The Long Range Anti-Ship Missile (LRASM) is based off another land-attack weapon, the Joint Air-to-Surface Standoff Missile (JASSM) introduced in the mid-2000s. Originally designed to be launched from aircraft, the LRASM is being modified to be fired from the generic vertical launching tubes outfitted on all U.S. destroyers and cruisers and has an advertised range of over 200 nautical miles. Air-launched versions of the LRASM are starting production, but the ship-launched version is probably still a few years from being deployed. While over 2000 Tomahawk cruise missiles have been fired in combat, none have faced the advanced air defenses that a modern warship would deploy against it. The Tomahawk was designed in the early 1980s, and while its sensors and guidance systems have been heavily upgraded, it is subsonic and has a large airframe with no stealth attributes, potentially making it vulnerable to sophisticated defense systems. The LRASM is also subsonic, but is smaller than the Tomahawk and was designed with stealth features specifically for use against highly defended targets. This profusion of ASCMs poses loadout dilemmas for the U.S. Navy. The Tomahawk, LRASM, and SM-6 are all launched from the Vertical Launch System (VLS). U.S. destroyers carry 96 VLS tubes and cruisers have 122, but have to carry a mix of weapons for a variety of missions, that also include other air-defense missiles and rocket-launched torpedoes for use against submarines. 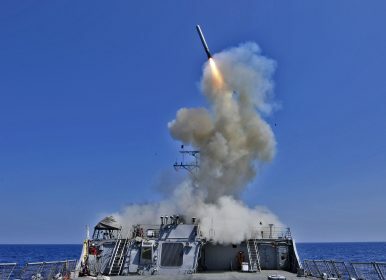 The Tomahawks will still be prized primarily for their land-attack missions, raising questions about how many should be allotted for an anti-ship mission that LRASMs might be more effective at. But the Navy has a few years to work that out, since neither missile is expected in the fleet before the early 2020s. U.S. defense contractor Lockheed Martin has delivered the first set of Long-Range Anti-Ship Missiles to the U.S. Air Force.